Manchester United have regained their status as the world’s most popular football club by sales of official replica shirts according to authoritative new research. The Old Trafford club sold an average of 1.75m shirts per year in the five-season period from 2011-12 to 2015-16 inclusive. That puts them in the No1 spot in European football – and the world. The data has been compiled by industry insider Dr Peter Rohlmann and his team at the consulting bureau, PR Marketing, and is published for the first time by Sportingintelligence today. Real Madrid are No2 in the list, averaging 1.65m shirts per year in the period under review ahead of Barcelona in third, Bayern Munich in fourth and Chelsea in fifth. There is major financial significance in being able to shift huge amounts of official merchandise. The more gear a club can sell, the more money a manufacturer will pay to be an official kit supplier. Chelsea confirmed their new £900m, 15-year deal with Nike last week, for example, equating to a contract worth £60m a year. United have a deal with adidas worth £75m a year, while the Spanish giants of Real and Barca both have new deals worth around £100m a year. That quartet beat everyone else by some distance. Dr Rohlmann is a veteran analyst who has authored a number of in-depth studies into kit supply deals and sales by Europe’s elite clubs. This website carried an earlier study for the 5-year period 2007 to 2012 in October 2012 here. By 2014, Real Madrid’s growth had edged just ahead of United’s, putting Real into the No1 spot as both clubs sold more each year, but United’s growth has taken a spurt and they are back at the top in the latest analysis. 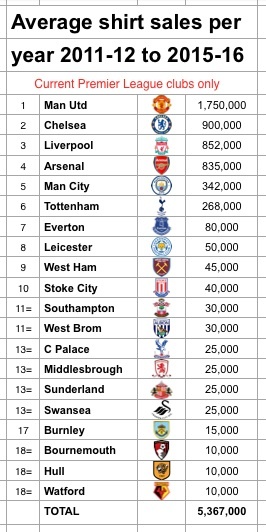 Just four clubs have had annual average sales of more than one million shirts per year over a five-year period. a: Dr Rohlmann counts sales of official genuine replica club shirts. Counterfeits and copies are not part of these totals. Methodology is not always clear in other studies. b: A five-year period of data is seen as vital to overall accuracy as most clubs’ sales will ebb and flow dependent on success and signings, although individual players are often not as influential in sales as some claim. c: While the replica shirt is the most obvious and visible piece of merchandise that a manufacturer will monetise from their commercial relationship with a club, there will typically be many dozens of other lines of clothing and apparel where money is made as part of the same contract. So, for example, Adidas selling almost 2 million Manchester United shirts in a year at around £50 each is far from the whole story of that company’s revenue from United. Millions of other items from shorts and socks to hats, bags, training gear, tops, coats and other accessories – often even more expensive than a shirt – are also shifted annually. Aside from United moving back to the top spot, the other major movers in recent years have been Bayern Munich, PSG, Dortmund and Manchester City moving up the shirt sales rankings as they have returned to global prominence or gained it for the first time. The Italian giants of Milan and Inter are among the fallers as their fortunes have waned. The Premier League’s 20 clubs are expected to sell more than five million replica shirts this season collectively, generating revenues of around £265million. United top the popularity stakes, having sold an average of 1.75m shirts each season over the last five years with Chelsea second ahead of Liverpool. Liverpool’s hard-earned worldwide appeal from their prior long-term dominance of the English game endures despite not having won the title for decades. In many senses United and Liverpool remain the two biggest ‘properties’ globally in English football and the United-Liverpool fixture, next played tomorrow, remains the biggest global draw in the Premier League calendar. (In terms of global audience figures). United, Chelsea and Liverpool between them sell nearly two-thirds of all club shirts sold in the Premier League. (That’s 3.5m a year from 5.367m). Premier League shirt sales have risen from a league average of 4.8 million a year from 2007-08 to 2011-12, up to almost 5.4million for the past five seasons. Revenues are split between manufacturers and clubs, with the kit makers raking in the lion’s share. Dr Rohlmann’s latest research found the average shirt price last season of an adult home shirt was £49.45 (short sleeved, without personalised name-printing or Premier League badge, which costs a further £8-£15). Sales of Leicester shirts increased to six figures last season as the club miraculously romped to the title. The club enjoyed a strong sales boost in Asia, but their five-year average is much lower as they played in the Championship for two out of the five years covered in the research. Before becoming champions, the Foxes were selling shirt numbers in ‘the low five-digits’. Relegated Newcastle traditionally sell over 100,000 shirts per season, but it remains to be seen if last season’s fall into the Championship adversely affects sales this season. Rohlmann said: “Generally, the sales of replica shirts have increased at a constant growth rate. Football jerseys are more popular than ever and their attractive designs increasingly mean fans want to wear them away from match days”.